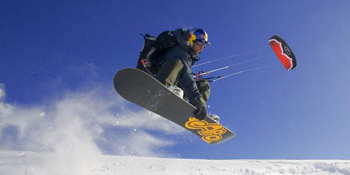 Discover snowkiting on Lake Dillon, a fun winter sport that combines snowboarding and parasailing. Strap into your favorite snowboard, climb into the parasail harness and let the wind do its magic. Rental equipment & instruction available from companies near Frisco and Dillon. Sorry no Activities & Snowkiting items in Breckenridge, CO but Click Here for more items nearby.